Manuela Veloso, a computer scientist renowned for her work in artificial intelligence and robotics is the new head of the Machine Learning Department. She succeeds Tom Mitchell, E. Fredkin University Professor and the founding head of the Machine Learning Department, who remains a member of the faculty. Manuela is currently the Herbert A. Simon University Professor in the Computer Science Department, with courtesy appointments in the Machine Learning Department, Robotics Institute, Electrical and Computer Engineering Department, and Mechanical Engineering Department. 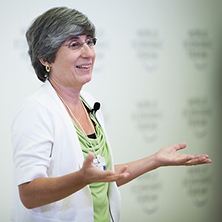 Manuela Veloso joined CMU thirty years ago as a PhD student. She finished her PhD advised by Jaime Carbonell, and in August 1992, she became faculty in the Computer Science Department. Her thesis was on planning and learning by analogical reasoning. "In those late 80s and early 90s, the conversation and work in CS, in addition to chess, was about problem solving, agents, and learning: explanation-based learning, neural network learning, planning and learning, speech and learning, vision and learning, cognitive architectures for learning and problem solving,... I believe that most of the PhD theses in AI, advised by Allen Newell, Jaime Carbonell, Tom Mitchell, Raj Reddy, and Herb Simon, all included learning approaches and algorithms. Since those early days, I quest for autonomated learning to improve complex automated problem solving," Veloso says. Veloso founded the CORAL lab, home of her research with her students on autonomous agents that Collaborate, Observe, Reason, Act, and Learn, www.cs.cmu.edu/~coral. With her students, she researches with a variety of autonomous robots, including teams of soccer robots, and mobile service robots. Manuela Veloso is IEEE Fellow, AAAS Fellow, AAAI Fellow, and the past president of AAAI. She is co-founder, trustee, and past president of RoboCup. See www.cs.cmu.edu/~mmv for further information, including publications. Veloso currently works with PhD students Junyun Tay, Richard Wang, Juan Pablo Mendoza, Max Korein, Danny Zhu, Tiago Pereira, Vittorio Perera, Philip Cooksey, Rick Goldstein, Devin Schwab, and Rui Silva. Her past PhD students, in reverse graduation order are: Susana Brandao, Mehdi Samadi, Joydeep Biswas, Tekin Mericli, Brian Coltin, Prashant Reddy, Felipe Trevizan, Somchaya Liemhetcharat, Stephanie Rosenthal, Cetin Mericli, Sarah Aboutalib, Stefan Zickler, Sonia Chernova, Elisabeth Crawford, Colin McMillen, Brenna Argall, Yang Gu, Douglas Vail, Elly Winner, Maayan Roth, James Bruce, Scott Lenser, Patrick Riley, Rune Jensen, Michael Bowling, William Uther, Belinda Thom, Bryan Singer, Peter Stone, Astro Teller, Karen Haigh, and Yury Smirnov.